Akari Shinohara: Hey... 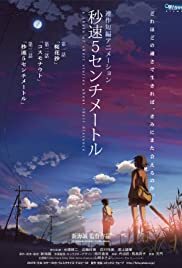 They say it's five centimeters per second. Takaki Toono: What do you mean? 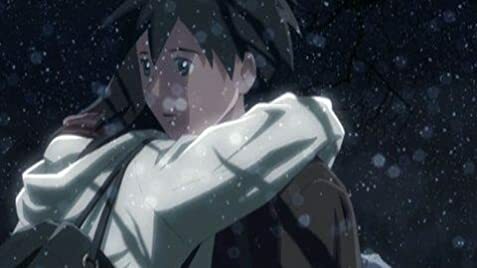 Akari Shinohara: The speed at which the sakura blossom petals fall... Five centimeters per second. I could copy almost my entire review of THE PLACE PROMISED IN OUR EARLY DAYS, Shinkai's previous film. More Takahata than Miyazaki... check. The same wistful, nostalgic tone is woven throughout these three episodes of youthful romantic pinings turned into bittersweet adult reminiscences. Breathtaking animation... check. The artistic style is uncommonly beautiful, with extraordinary attention to detail, gorgeous color and lighting, and images that deftly evoke a sense of melancholy. If all anime looked this astonishing, I'd watch more of it. Satisfying human elements but oversentimental... check. I could relate to the feelings expressed by Takaki, Kanae and Akari -- surely there is something nearly universal about those unrequited adolescent yearnings that can resurface years and years later -- but had to roll my eyes a bit at all the tinkly piano and whispered voice-over. Where this film surpasses its predecessor is in its lack of a goofy sci-fi subplot. There is a rocketship involved, but it's a background element purely for metaphorical purposes. Without that sort of distraction, I was more easily charmed by the gentle rhythms, pleasant characters, and lovely visuals.